Bacteria in the slime under flowing sewage convert sulphates in the sewage into sulphides. Sulphides in the liquid make their way to the surface of the sewage and released into the sewer atmosphere as hydrogen sulphide (H2S) gas. 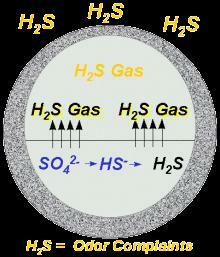 H2S gas in atmosphere makes contact with slime in the crown of the sewer , which contains more bacteria. 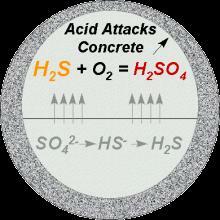 Bacterial action converts,H2S gas to sulphuric acid which causes corrosion in the crown of the pipe and this corrosion is also called crown corrosion. If pipe material is of corrodible nature sulphuric acid attacks the pipe material and causing ultimate failure. Design shall provide for self-cleansing velocity, good ventilation, low turbulence, flushing facilities, minimal periods of flow and minimum stagnation. Pipes made of inert materials are preferable. In case of large diameter pipes, RCC with sacrificial lining of 25 to 50mm thick is the suitable pipe material. layer may increase the life expectancy of the pipe by 3 to 5 times. RCC pipes are manufactured with sulphate resistant cement when the soil contains sulphur and other corrosive substances. For metallic pipes (DI or MS) the acceptable linings are cement mortar lining either with sulphate resistant or high alumina cement. The design of sewer section with a depth of flow of about 0.8D will minimize the chance of corrosion. Good ventilation usually removes condensation in the immediate vicinity of the air inlet.